The “Valkenburg Castle” Game Box is an updated and enhanced digital version of a long-out-of-print game. It is being re-published for use with BGE with permission from the original designer (and current copyright holder), Stephen V. Cole (who is most known for his highly successful “Star Fleet Battles” games and expansions). Originally published in 1980 by Task Force Games as one of their Pocket Game series, Valkenburg Castle is a fantasy game of adventure and combat in the depths of an ancient dungeon. Players may use heroic leaders, clever burglars, staunch dwarves, mysterious magic users, and squads of fighting men to explore, and eventually to capture the castle from evil orcs, sorcerers, trolls, ogres, and other monsters (including a dragon!). Two or more players maneuver their units on a game map which depicts the five levels of the dungeon beneath the castle (the game is played in three dimensions). A solitaire scenario is included, and there’s even a game variant which lets you assault the dungeon with modern combat squads equipped with rifles, submachine-guns, hand grenades, and demolition charges. The game features 5 scenarios and a campaign game. I invite everyone to download the first ten pages of the 57-page rulebook to learn more details about the game and to see if it peaks your interest. So what exactly is a “Game Box”? Game Boxes for BGE are simply a distribution package, which includes an artpack containing the playing board (generally a map), digital tokens (in lieu of cardboard counters or plastic minis), and the game’s charts and tables. 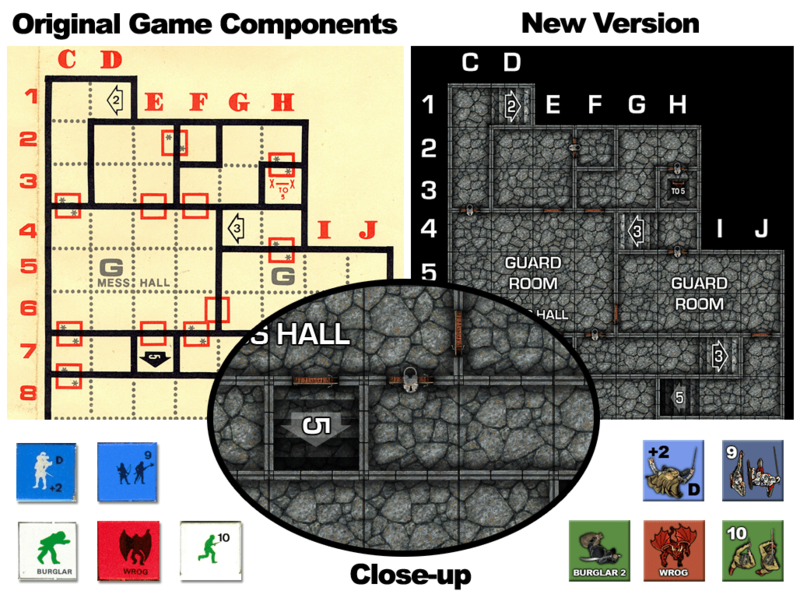 Game Boxes will also include the following files: dice macros, Game Files and Deployment files, custom Turn Sequencer settings and Preferences, a rulebook in PDF format (searchable), and installation instructions. In short, everything needed to play the game if you already have at least one Gamer Client license (BGE v1.5 or higher). For multiplayer games, the extra players do not need to purchase the Game Box, but they will need a Gamer Client of their own, or they can use the free BGE Demo if the person hosting the game has enough free Player Slots available for them to use.